New Delhi: Finance Minister Piyush Goyal on Friday presented the Interim Budget 2019, the last of the current government before the Lok Sabha elections. Amid all the speculations of some big-ticket announcements, Goyal announce tax sops for the middle class and the corporates along with a relief package to address agrarian distress and the stressed small-scale industry sector. Government makes first announcement for farmers — Rs 6000 to be transferred directly into farmers’ accounts in three equal instalments for those who own farm of 2 hectares or less. The move will benefit 12 crore farmers at an estimated cost of Rs. 75,000 crore, says Piyush Goyal. In place of rescheduling of crop loans, all farmers severely affected by severe natural calamities will get 2 per cent interest subvention and additional 3 per cent interest subvention upon timely repayment. In case of untimely death of an employee, the amount paid by EPFO has been increased from Rs 2.5 lakh to Rs 6 lakh. Mega Pension Yojana, namely Pradhan Mantri Shram Yogi Mandhan, to provide assured monthly pension of 3000 rupees per month, with contribution of 100 rupees per month, for workers in unorganised sector after 60 years of age. “Will benefit 10 crore workers in unorganised sector, may become the world’s biggest pension scheme for unorganised sector in five years,” says Piyush Goyal. Rs 1 crore loan can now be obtained under 59 minutes, says Finance Minister Piyush Goyal. Already disbursed 35,000 crore rupees for our soldiers under OROP, substantial hike in military service pay has been announced, says FM Goyal. Defence budget enhanced beyond 3 lakh crore rupees. “Our soldiers are our pride and honour. Our defence budget for the first time has increased from Rs 3 lakh crore and additional funds will be provided,” says Piyush Goyal. Vande Bharat Express will provide speed, service and safety to citizens and will give a boost to Make In India. Allocation for North Eastern egion proposed to be increased to Rs 58,166 crore in this year, a 21% rise over previous year. Single window clearance for film-making to be made available to Indian filmmakers, anit-camcording provision to be introduced to Cinematography Act to combat film privacy. Simplification of direct tax system will benefit taxpayers; direct tax reduced and tax interface made simpler and faceless to make life easier; resulting in increase in tax collections and return filings. Within almost two years, almost all assessment and verification of IT returns will be done electronically by an anonymized tax system without any intervention by tax officials, says Goyal. Direct tax collections increased from Rs 6.38 lakh crore in 2013-14 to almost Rs 12 lakh crore; The tax base is up from Rs 3.79 crore to 6.85 crore. Businesses with less than Rs 5 crore annual turnover, comprising over 90 per cent of GST payers, will be allowed to file quarterly returns. GST collections in January 2019 has crossed 1 lakh crore rupees, says Piyush Goyal. GST registered MSME units to get 2% interest subvention on loan of 1 crore. We are poised to become a 5 trillion dollar economy in the next 5 years and we aspire to become a 10 trillion dollar economy in the next 8 years, says Piyush Goyal. FM announces fiscal deficit as a proportion of GDP – 3.4% for the coming year, considering need for income support for farmers. Along with completion of fiscal deficit consolidation programme, we will now focus on debt-to-GDP ratio consolidation, says Piyush Goyal. 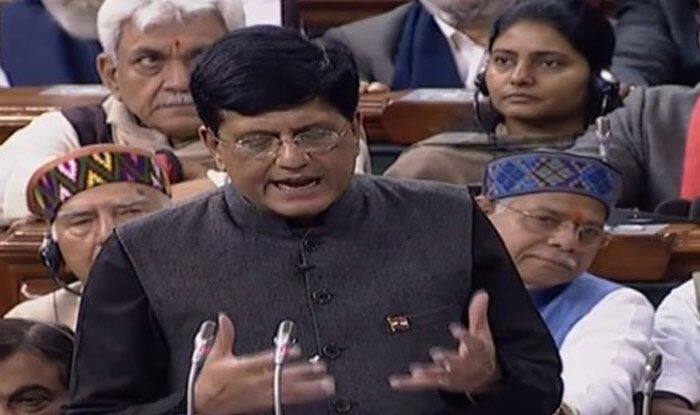 56,619 crore made in budget estimate 2018-19 for welfare of SCs and STs, increased to 62,474 crore in revised estimate 2018-19 has been further increased to 76,800 crore in budget estimate 2019-20, says Goyal. Tax exemption limit increased from current Rs 2.5 lakh to Rs 5 lakh.